Clear Channel Shows its Stripes | Broadcast Public Service: Local Stations. Big Impact. 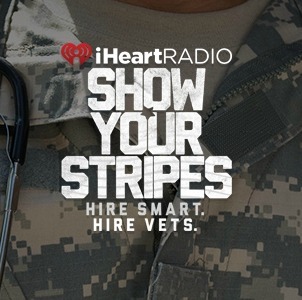 Clear Channel Media and Entertainment plans to spend $75 million on iHeartRadio’s ShowYourStripes.org, which connects businesses and job-seeking veterans. Elton John, Kelly Clarkson, Carrie Underwood, Brad Paisley, Ryan Seacrest, Trace Adkins and LL Cool J recorded PSAs featuring stories from veterans who successfully found jobs. Clarkson highlights Jeff Marshall, a 10-year member of the U.S. Air Force special operations command who now works in online operations at Facebook.